On this week’s Everything Financial Radio Program, Host Dennis Tubbergen speaks with founder and chairman of the Longwave Group, Mr Ian Gordon. Dennis spoke with Mr. Gordon about his the current state of our economy and economic cycles. Everything Financial Radio – May 3, 2015 Air Date. A globally renowned economic forecaster, author and speaker, Ian Gordon is founder and chairman of the Longwave Group, which comprises two companies—Longwave Analytics and Longwave Strategies. The former specializes in Gordon’s ongoing study and analysis of the Longwave Principle originally expounded by Nikolai Kondratiev. With Longwave Strategies, Gordon assists select precious metal companies in financings. Educated in England, Gordon graduated from the Royal Military Academy, Sandhurst. After a few years serving as a platoon commander in a Scottish regiment, he moved to Canada in 1967 and entered the University of Manitoba’s History Department. Taking that step has had a profound impact because, during this period, he began to study the historical trends that ultimately provided the foundation for his Long Wave theory. Gordon has been publishing his Long Wave Analyst website since 1998. On this week’s Everything Financial Radio Program, Host Dennis Tubbergen speaks with Pulitzer Prize winning author David Cay Johnston. Dennis chatted with Mr. Johnston about his latest book, Divided: The Perils of Our Growing Inequality. Everything Financial Radio – April 26, 2015 Air Date. On this week’s Everything Financial Radio Program, Host Dennis Tubbergen speaks with guest expert Todd Knoop, David Joyce Professor of Economics and Business at Cornell College. Dennis chatted with Mr. Knoop about the world economy and the potential for a recession. Mr. Knoop offered some interesting opinions on the health of the Chinese economy and how a hard economic landing there will affect the United States and, perhaps even more importantly, US investors. You won’t want to miss this interview with Mr. Knoop. Everything Financial Radio – April 12, 2015 Air Date. Todd A. Knoop, David Joyce Professor of Economics and Business at Cornell College, is the author of multiple articles as well as the books Business Cycle Economics: Understanding Recessions and Depressions from Boom to Bust , Global Finance in Emerging Market Economies , Recessions and Depressions: Understanding Business Cycles , and Modern Financial Macroeconomics. On this week’s Everything Financial Radio Program, Host Dennis Tubbergen speaks with guest expert Mr. Jonathan Kirshner. Mr. Kirshner, a professor at Cornell University discusses the financial crisis causes and gives us his opinion as to the likelihood of experiencing another financial crisis among other discussion topics. Everything Financial Radio – April 05, 2015 Air Date. Jonathan Kirshner is the Stephen and Barbara Friedman Professor of International Political Economy in the Department of Government at Cornell. His research and teaching interests focus on International Relations, political economy (especially macroeconomics), and politics and film. His recent books include American Power after the Financial Crisis, and Hollywood’s Last Golden Age: Politics, Society and the Seventies Film in America. Mr. Kirshner’s first book,Currency and Coercion: The Political Economy of International Monetary Power explored how states manipulate international monetary relations to advance security-related goals. Another book, Appeasing Bankers: Financial Caution on the Road to War, illustrated how financial interests (such as banks) and international financial markets can shape and constrain states’ grand strategies and influence decisions about war and peace. Appeasing Bankers won the best book award from the International Security Studies Section of the International Studies Association. 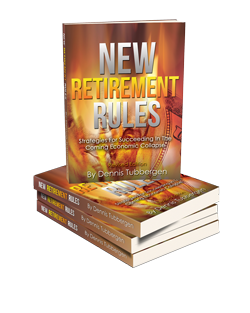 On this week’s Everything Financial Radio Program, Host Dennis Tubbergen speaks with guest expert and prolific author Mr. Karl Denninger. You won’t want to miss it. It was a very interesting conversation on a topic that affects many Americans. Everything Financial Radio – March 29, 2015 Air Date. Mr. Denninger is the former CEO of MCSNet, a regional Chicago area networking and Internet company that operated from 1987 to 1998. MCSNet was proud to offer several “firsts” in the Internet Service space, including integral customer-specified spam filtering for all customers and the first virtual web server available to the general public. Mr. Denninger’s other accomplishments include the design and construction of regional and national IP-based networks and development of electronic conferencing software reaching back to the 1980s. He has been a full-time trader since 1998, author of The Market Ticker (http://market-ticker.org), a daily market commentary, and operator of TickerForum, an online trading community, both since 2007. Mr. Denninger received the 2008 Reed Irvine Accuracy In Media Award for Grassroots Journalism for his coverage of the 2008 market meltdown. On this week’s Everything Financial Radio Program, Host Dennis Tubbergen speaks with guest expert and best-selling author, Harry S. Dent, Jr. You won’t want to miss it. It was a very interesting conversation on a topic that affects many Americans. Everything Financial Radio – March 22, 2015 Air Date. Harry S. Dent, Jr. is the founder and President of the H. S. Foundation whose mission is “Helping People Understand Change”. Using exciting new research, developed from years of hands-on business experience, Mr. Dent offers a refreshingly positive and understandable view of the future. Harry has written numerous books over the years. In his book The Great Boom Ahead, published in 1992, he stood virtually alone in accurately forecasting the unanticipated boom of the 1990s. That same year he authored two consecutive best sellers: The Roaring 2000s and The Roaring 2000s Investor (Simon and Schuster). In The Next Great Bubble Boom, he offered a comprehensive forecast for the following two decades. In The Great Depression Ahead, he outlined how the next great downturn is likely to unfold in three stages, with an interim boom stage between 2012 and 2017 before the long-term slowdown finally turns into the next global boom in the early 2020s. In The Great Crash Ahead (2011), he outlined how the next great crash is likely to unfold in the coming months. He explained why there is nothing the government can do to protect us as deflation takes hold of the economy. He also recently finished his book, Spending Waves: The Scientific Key To Predicting Market Behavior for the Next 20 Years, an information-packed guide for any serious business owner. Mr. Dent’s latest book, The Demographic Cliff – How to Survive and Prosper During the Great Deflation of 2014–2019, shows why we’re facing a “great deflation” after five years of stimulus — and what to do about it now. On this week’s Everything Financial Radio Program, Host Dennis Tubbergen speaks with guest expert Mr. Daniel Di Salvo, Assistant Professor at New York City University. Dennis spoke with the Professor on his recent book, “Government Against Itself: Public Union Power and Its Consequences”. It was a very interesting conversation on a topic that affects many Americans. Everything Financial Radio – March 8, 2015 Air Date. Daniel DiSalvo is an assistant professor of political science at the City College of New York – CUNY. He received his doctorate in politics from the University of Virginia and served as Andrew W. Mellon Visiting Professor at Amherst College. He has written about American political parties, elections, labor unions, and public policy. He has written on these topics for National Affairs, The Public Interest, The Weekly Standard, Commentary, New York Daily News, The Tocqueville Review, Congress & the Presidency, and the Journal of Policy History. On this week’s Everything Financial Radio Program, Host Dennis Tubbergen speaks with guest expert Mr. Lawrence Reed, President of the Foundation for Economic Education. Dennis chats with Mr. Reed about his recent article asking whether Jesus was a progressive and get his views on the current economy and what might lies ahead for folks who are managing a nest egg. Everything Financial Radio – March 1, 2015 Air Date. Lawrence W. Reed became president of the Foundation for Economic Education in 2008. He was a founder and president for twenty years of the Mackinac Center for Public Policy in Midland, Michigan. A champion for liberty, Reed has authored over 1,000 newspaper columns and articles, dozens of articles in magazines and journals in the U. S. and abroad, as well as five books. His articles have appeared in The Wall Street Journal, Christian Science Monitor, USA Today, Baltimore Sun, Detroit News and Detroit Free Press, among many others. His interests in political and economic affairs have taken him as a freelance journalist to 81 countries on six continents. Lawrence W. Reed holds a B.A. degree in Economics from Grove City College (1975) and an M.A. degree in History from Slippery Rock State University (1978), both in Pennsylvania. In his spare-time interests include reading, travel, fly-fishing, hiking, skydiving, and animals of just about any kind. On this week’s Everything Financial Radio Program, Host Dennis Tubbergen speaks with guest expert Mr. Peter Schiff, Fox News analyst and host of Schiff Radio. You won’t want to miss it. Everything Financial Radio – February 22, 2015 Air Date. Peter Schiff is one of the few non-biased investment advisors (not committed solely to the short side of the market) to have correctly called the current bear market before it began and to have positioned his clients accordingly. As a result of his accurate forecasts on the U.S. stock market, economy, real estate, the mortgage meltdown, credit crunch, subprime debacle, commodities, gold and the dollar, he is becoming increasingly more renowned. He has been quoted in many of the nation’s leading newspapers, and appears regularly on CNBC, CNN, Fox News, Fox Business Network, and Bloomberg T.V. His best-selling book, “Crash Proof: How to Profit from the Coming Economic Collapse” was published by Wiley & Sons in February of 2007. His second book, “The Little Book of Bull Moves in Bear Markets: How to Keep your Portfolio Up When the Market is Down” was published by Wiley & Sons in October of 2008. On this week’s Everything Financial Radio Program, Host Dennis Tubbergen speaks with guest expert Adam Seth Levine, author of American Insecurity: Why Our Economic Fears Lead to Political Inaction.Mr. Levine is an associate professor at Cornell University. You won’t want to miss it. Everything Financial Radio – February 15, 2015 Air Date. Adam Seth Levine is an assistant professor in the Department of Government at Cornell University. His research and teaching touch on the areas of economic insecurity, economic inequality, political behavior, and political communication. He has published in a variety of outlets such as the Journal of Politics, Political Analysis. Review of Behavioral Economics, and Political Communication. His work has won numerous awards, including the 2011 E. E. Schattschneider Prize. This prize is the highest dissertation award in the field of American government and is given annually by the American Political Science Association.